Based on the popularity of my other crock pot “real food” recipes I think you guys will love this one, too. Slow cookers are great for entertaining because you can easily get all the work done in advance and have your house smelling amazing when guests arrive (we use this basic, inexpensive slow cooker). I just made these fajitas myself the other day and my daughters kept asking me “What smells so good? 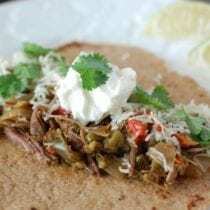 ?” They couldn’t wait to dig in and if you make the tortillas in advance it will just take some grated cheese, sour cream, and cilantro (plus any other fixings you like on your fajitas), and your feast will be ready in no time. I am getting hungry just talking about it. But don’t take my word for it…you must try it for yourself! Mix together the dry spices with a fork including the chili powder, cumin, coriander, salt and pepper. Rub the spice mixture over all sides of the flank steak and place it in the bottom of the slow cooker. Sprinkle the soy sauce on top. Top the flank steak with the diced jalapeno and minced garlic. Slice the bell peppers and onion and throw those on top of the steak as well. Turn the slow cooker onto HIGH and cook for 5 – 6 hours or until the steak can easily be shredded with two forks. Drain the meat and peppers well then serve with the recommended fajita “fixings” (listed above). I love these fajitas! They are full of flavor and so simple to prepare. They are a life saver for someone like me who is health conscious and has a hectic schedule. Awesome recipe! Thank you for sharing. Love this recipe! Thank you for posting Lisa. It is a favorite in our house! I have made this recipe several times and it’s always a huge hit! Tomorrow I plan to double the recipe and am wondering if I need to increase the amount of time on high it spends in the slow cooker? Thanks! Hi Kristen. We are not usually able to respond to recipe questions in real time. How did it turn out? Hi Elissa. You could use a chuck or round roast. I decided it was time to post a review since this is such a regular recipe in our house! We all love it here and it is by far one of my favorite slow cooker recipes. I just wanted to mention that I have occasionally used bison sirloin steaks for this in and it turned out beautifully! I didn’t realize I was going to make this until last minute so I didn’t have time to slow cook it. Instead I cut up the grass fed steak (don’t remember what cut I picked up, it was marbeled without a bone), doubled the “sauce” and let it marinade in the fridge for about an hour. I cut up the onions and peppers and sauteed them in some unsalted grass fed butter and then added the meat and mixed it well (and it seasoned the veggies to perfection without any additional seasoning needed). We have a local place that gets fresh 4 ingredient tortillas so I served it on those. I used the tomatillo salsa from your website with some organic sour cream and Daiya cheese and my kids inhaled it and my super picky husband said it was beyond delicious. Thank you for all your hard work and time you put into this website. It is my first go to when I need any type of recipe. Do I need to add any liquid to this recipe? Is it okay to cut up the steak before putting it in the slow cooker? Hi Sarah. We’ve not tried because we shred is at the end. I imagine that small pieces will work, too. can I use skirt steak instead of flank? if not what else can I use? Any idea what the nutritional values are on this receipt? Hi Caroline. We do not provide those details. This post might help explain why: https://www.100daysofrealfood.com/2013/01/04/healthy-eating-defined/. Have you ever made this on low? How long would it take? Also, do you (or any of your readers) know why my food always seems overcooked in my crock pot even when I follow the recipe to a tee? Some readers have cooked it on low for 8+ hours. Absolutely love this! We tried it in the Fall and it became part of our regular rotation. It’s also great for entertaining. I used 3+ lbs of steak and it cooked up beautifully. totally agree, this is an awesome easy recipe. I used a london broil and it came out great. I also added a small amount of adope chipoltes and it gave it a bit of zing. It resembled the Chipolte barbacoa. Is there any other liquid besides the soy sauce? No, it will make its own liquid. I have made this repeatedly in my electric pressure cooker. It takes only 40 minutes and it turns out perfectly every time! This was the first recipe I’ve ever found to use flank steak in the slow cooker. So healthy and lean but comes out perfectly shreddable with this method. Love your blog and recipes, Lisa! Thank you for commenting on the electric pressure cooker. I just got mine and this is one of my favorite recipes. I wasn’t sure how to convert. I love the pressure cooker!! I always use slow cooker recipes and they always turn out perfectly. I was thinking about doing this in my instant pot also.. but you need atleast a cup of liquid to do so… could you tell me how you cooked it? This was so good I had a hard time stopping! I did it on high for six using local range skirt (bavette) beef. Big bang for the effort! This recipe goes in my “frequent” file for taste, simplicity and economy. I liked the contrasting taste of corn tortillas but I think any tortilla would work just fine. I have been using pork tenderloin and it’s excellent. The flank steak had great flavor but it was too tough for my little one to eat. I made this in the slow cooker, followed all the directions, and although the flavor was pretty good, the meat was still kinda tough. It shredded easily, but was a little difficult to chew/tear apart when eating a fajita taco. I’ve always encountered this problem with flank steaks; maybe it should be tenderized first? I started making this recipe with pork tenderloin instead for this same reason. It’s just as great and a lot easier to eat, especially for my little one. How you slice meat makes a big difference in how tender, or not, it is. It is important to cut against the grain, which shortens the fibers and makes it easier to chew through them, since most of the work will have been done with the knife. What that means is cut across the grain, to shorten the muscle fibers, rather than cutting parallel to the grain/muscle fibers. Cutting parallel to/with the grain leaves you with a chewier cut of meat. Not great. I cook fajitas in the slow cooker all the time and wanted to try something different. I should’ve listened to my gut and browned all the meat before cooking it in the slow cooker with everything else. Absolutely delicious and the house smells great for hours!! Does this work well as a freezer meal? Yes, the meat freezes well. Add the other components when ready to serve. Is there nutritional (or at least calorie) info on this dish? Sorry if I missed it! Made it tonight and the whole (almost) family loved it. No. It produces liquid on its own. This recipe came out delicious and I would definitely make it again. However, next time I would wait to put the peppers in until the last hour. I ended up with very mushed peppers and lots of tough separated pepper skin. Wow! 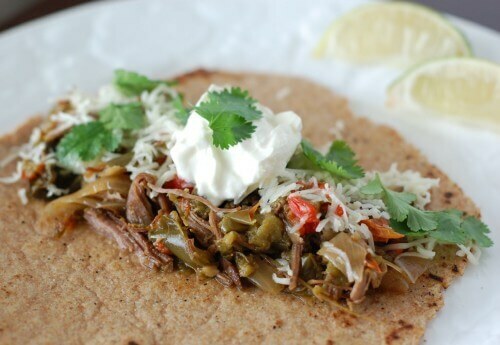 This was delicious and ridiculously easy to thrown into the slow cooker and perfect for a busy week night when we’re coming home late and hungry from activiities. I used flap steak (steak tips) as that’s what I had on hand. Yummy. Thanks for a great recipe. I’m excited to try your other ones! I love this recipe and so does my family. It is so yummy! I forgot to rate the recipe. I love my crockpot. I use it all the time and this recipe is so easy and perfect for making in the crockpot. Delicious! I added a can of fire roasted diced tomatoes and squeezed a lime into the slow cooker. Easy, delicious and the entire family loved it!